It has become a political ritual: in February 2014, shortly after his election, Hery Rajaonarimampianina, Madagascar’s newest president, publicly denounced the “plague” of illegal logging and the pillage of the island’s natural resources. In a special cabinet meeting at the presidential palace, he vowed to stop the “evil” of illicit rosewood and ebony exports, promising to step up enforcement with targeted raids, and presumably, arrests. But more than a year later, the only arrest to come in Madagascar’s latest fight against illegal logging is that of Armand Marozafy, a 49-year-old environmental activist and ecotourism guide who was convicted of defamation for naming two local businessmen he believed to be involved in rosewood trafficking. Last February, Marozafy wrote an email to David Negus, who, according to his website, is a Washington, D.C.-based consultant specializing in auditing and fraud investigations. 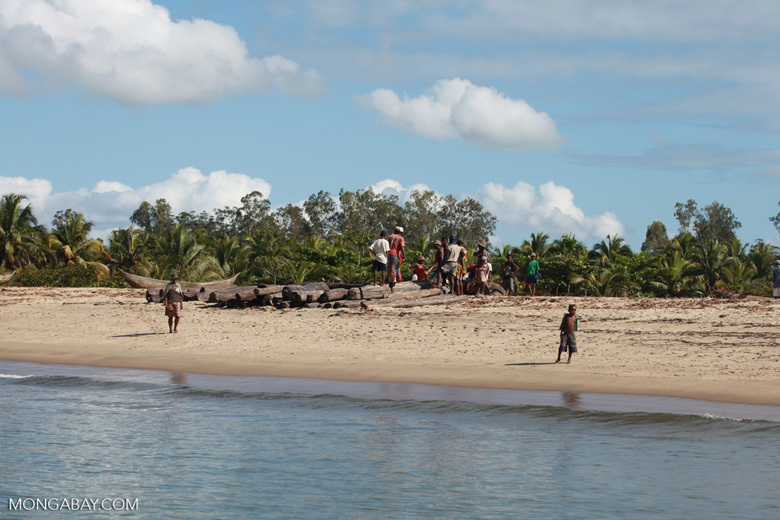 Marozafy made a series of allegations about new development on the fringes of Masoala National Park, a vast rainforest by the sea in northern Madagascar that is increasingly threatened by poaching and illegal logging. Armand Marozafy, an activist now serving jail time for defamation of businessmen linked to the illegal rosewood trade. Photo courtesy of Free Forest Madagascar. Marozafy went on to describe illegal construction and threats of violence against tourists who stepped off a cruise ship and onto the wrong public beach, pointing a finger at two local businessmen with ties to the rosewood industry. Within weeks, his email was circulating on Facebook, and caught the attention of prosecutors in the town of Maroantsetra. Marozafy was arrested on April 27. Though Marozafy’s attorneys maintain he had no part in releasing the email publicly, he was convicted for defamation under a law governing the media, as fellow activists protested outside the courthouse. He is now serving a six-month jail sentence, and has been ordered to pay nearly $4,000 in fines — three times what Malagasy school teachers make in a year. Marozafy has appealed his conviction, with a verdict expected on September 23. Alexander von Bismarck is director of the Washington, D.C.-based NGO the Environmental Investigation Agency (EIA), which has conducted extensive investigations of rosewood trafficking in Madagascar. He told Mongabay that Marozafy’s case lays bare a double standard in the Malagasy legal system for everything that touches rosewood. He also claimed that the judge who sentenced Marozafy had accepted a bribe from rosewood interests in exchange for doing so. “It’s not news that corruption in the forest sector is a terrible and intractable problem, but it’s been clear from the beginning that it’s fed by export of [rose]wood and the extraordinary profits that roll back and can pay off judges to create situations like this one,” von Bismarck said. 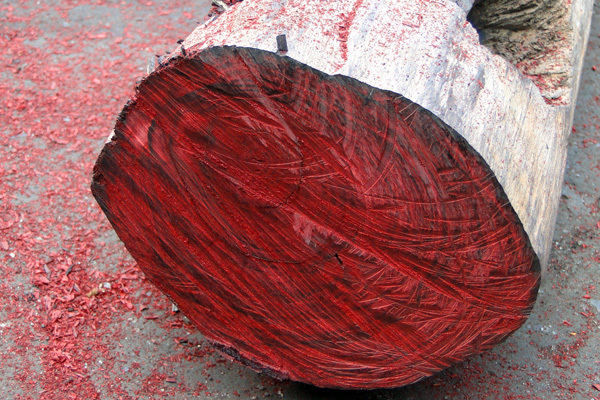 A rosewood log from Madagascar seized in Sri Lanka in 2014. Photo by Sri Lanka Customs. Rosewood (Dalbergia chapelieri) is a slow-growing hardwood prized by Chinese furniture makers and named for the tree’s deep purple core. Once abundant in forests throughout Madagascar, the tree’s high value has been its demise. One metric ton now fetches $25,000 in China, according to EIA’s research. Most remaining rosewood of commercial value is found deep within protected forests like Masoala National Park, where it adds a kind of multiplier effect to deforestation: the wood is so dense that four additional trees must be felled and lashed to a single rosewood log in order to float it out by river. Logging and export of rosewood has long been restricted in Madagascar, but efforts to control smuggling have repeatedly been stymied by weak enforcement. A moratorium on rosewood logging and export has been in place since 2010. Yet in 2014, even as some 40,000 rosewood logs worth as much as $100 million were seized at port, another 70,000 were exported with the blessing of the Minister of Ecology, Environment and Forests, according to accounts in the Malagasy press. 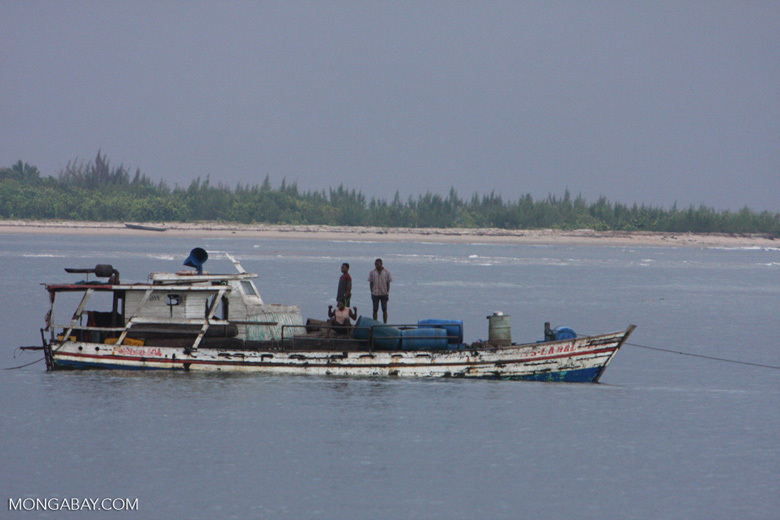 Rosewood timber smuggling boat in Madagascar, in 2009. Photo by Rhett Butler. Hope for ending the trade in Madagascar, von Bismarck said, comes from examples of foreign governments prosecuting illegal importers of Malagasy rosewood. For example, in 2011 the U.S. Justice Department raided Memphis-based Gibson Guitar Corporation, which used Malagasy rosewood in at least ten of its guitars. The guitar maker ultimately avoided prosecution for violating the Lacey Act, which prohibits trade in illegal plant or animal species, with a $350,000 settlement. But von Bismarck said Gibson’s example has effectively ended the use of rosewood throughout the American guitar industry. “The problem is that’s basically a drop in the bucket, because the vast majority of the wood goes to China,” von Bismarck said. Activists have garnered limited successes around the world in pushing better shipping enforcement at ports or lobbying for legislation similar to the United States’ Lacey Act. But while rosewood smuggling could be prosecuted under international law like the Convention on International Trade in Endangered Species (CITES), China, by far the largest source of demand, has so far shown little interest in enforcement. Rosewood in Maroantsetra, roughly 10 miles from Masoala National Park in Madagascar. Photo shot in 2009 by Rhett Butler. In Madagascar, the trade has intensified in recent years largely because of a protracted political crisis that precipitated the collapse of the country’s economy in 2009. A presidential coup that year led international donors to suspend aid to the country. At the same time, slackening tourism and steep price drops for several of Madagascar’s most important commodities, like vanilla and coffee, led to a 50 percent drop in exports in only two years. Writing in the journal Madagascar Conservation and Development, researchers Hery Randriamalala and Zhou Liu argue that the rosewood trade has come to follow a predictable cycle. First, international donors pressure the government to adopt tough forestry policies it is unable or unwilling to enforce. Next, as clandestine logging continues, a small but powerful group of rosewood traders accumulate stockpiles but don’t export them, fearful of having their cargo seized at port. Finally, logging interests take advantage of volatile periods in politics — “a cyclone, an election, or a difficult political transition,” Randriamalala and Liu write — to lobby for “extraordinary” export licenses, plying their allies in government with a share of the profits. Then the cycle begins again. 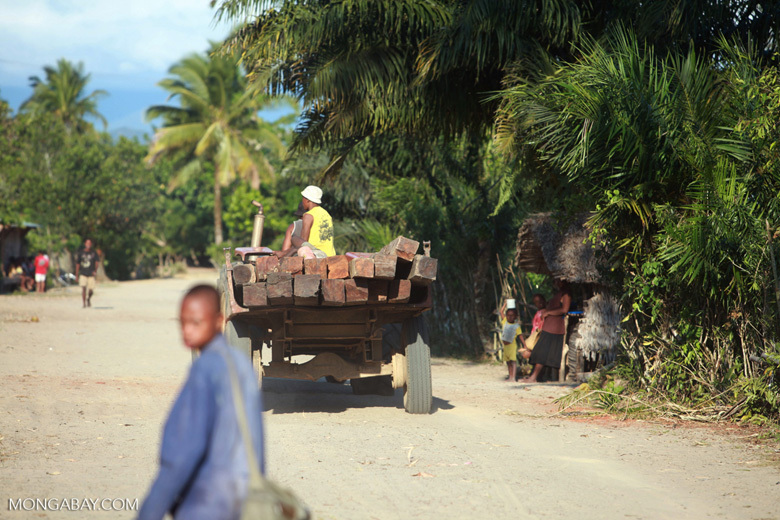 “One-time” permits allowing the export of existing stockpiles have been granted at least seven times since the year 2000, and Malagasy politics is rife with conflicts of interest shaped by the rosewood trade: one of the current president’s leading supporters on the campaign trail was Jean Pierre Laisoa, a member of parliament and exporter listed as the owner of dozens of containers of illegally logged rosewood logs held at port in 2010. Clovis Razafimalala, a co-founder of Lampogno, the NGO Marozafy works for, told Mongabay that politicians in Sava province where Masoala National Park is located are “either powerless or complicit” in the rosewood trade. Rosewood logs on the beach at Maroantsetra, roughly 10 miles from Masoala National Park in Magagascar. Photo shot in 2009 by Rhett Butler. Another Malagasy environmental activist who spoke on the condition of anonymity told Mongabay that money from the rosewood trade effectively “drowns” local government in some parts of the country’s northeast, where politicians are heavily dependent on illegal logging for campaign contributions. Local ecotourism outfits have been targets of unwarranted scrutiny by officials intent on “slowing down the industry” with financial audits, health inspections, threats against employees, and restricted access to protected areas, the activist said. “Ecotourism is a real hassle” for rosewood traders, he said. To Marozafy’s supporters abroad, the reason for his prosecution is simple — he is a vocal defender of the forest — and the message to would-be agitators is clear. Another local activist, August Sarovy, who fled Madagascar after receiving death threats for denouncing rosewood smuggling, remains, in his words, in “ecological” exile in Europe.